I have written a book. 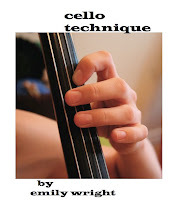 A cello technique book, to be specific. It’s sort of a manual for the technical aspects of the instrument, and I have been submitting it, one publisher at a time, for review. Yesterday, I came home to an ominous package that I immediately recognized as my manuscript, bereft of a book deal, from Oxford University Press. But when I opened the enclosure, there was a letter saying that they liked a lot of things, but that they wanted a much larger book, and gave me an example of a book that fit their criteria. Not 100% rejection, but in definite need of radical change. But I respect OUP, and I could easily bolster my existing content. Would you buy a chubby cello book? What would you like it to address? Perhaps I will put the table of contents and a sample chapter up for your perusal later this week. Thanks so much to everyone who is reading and sharing my blog. It is meaningful to me, and I appreciate the traffic and input! Previouspractice makes perfect. if you survive. I love your writing style, particularly your earlier post about adult “hobbyists” (of which I am one), but it is hard to say whether I’d rather have a 60 page book or a 200 page book without knowing the contents. Contents unseen, I’d go for the smaller book, to fit on the stand, and to focus on a more limited, seemingly achievable, group of tasks. My students have said similar things, and the temptation is so strong to leave the size as-is. I suppose the upside of a more epic book is the chance to write a “cello bible”: something that exhaustively, pictorially, realistically examines just what it takes to play the cello. I will publish the table of contents tomorrow, and hopefully more people will comment on that. Thanks so much for your input! PS: did you get to this page from my post on cello.org? By the way, if you’re so inclined to give it a look at any point, I’ve got a cello blog & one of the things I’m working on is developing new techniques & exercises to make technical playing/development more efficient for myself (and eventually for others… I think some day I’ll want to turn it into a method book, but that’s a long way off)… so anyway, your thread on cello.org caught my interest because of that…. looking forward to future posts..
As a teacher, and as a reader, cellist, and cello lover, I can say without hesitation that I’d much prefer a 60-page book over a 60-page book padded out to be a more expensive and unwieldy 200-page book! And I think most students and parents would prefer the 60-page version. OUP is very prestigious, of course, and has an excellent distribution system, so I understand your dilemma. Eric: yep, you’re right on. I would be happier if I could maybe have 3 volumes. 1 on bow, 1 for left hand tech and 1 for approach. I would never insult the reader with padding. To be honest, I love teaching and aesthetics way too much for a book under my name to be anything less than gorgeous to look at, useful as all get out, and reliably upbeat to read. All of the input from the site and this blog has been so fantastic. (cellists are a good bunch) I think I will talk to my girl at Oxford and depending on how that turns out, seek out other publishers who might share my preference for a tighter volume. Please keep your comments coming, and I encourage you to share this blog with any people who might be interested in such a method. Depends, I guess, on your target audience. As a late-starter, I’d be more inclined to buy and read the 60 page book, and use the time saved from the other 140 pages with my cello instead. Also, welcome to blogland! If you are interested in other blogging cellists, take a look at Cellobloggers. You’ll need to request an invitation (keeps out spammers), but it is relatively painless to join up.